Ciera Swaringen was born looking a lot different than others. 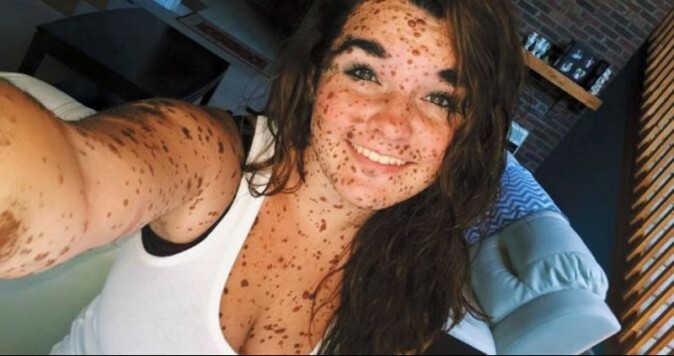 Her skin was covered in hundreds of oversized moles and birthmarks due to a rare skin affliction called Giant Congenital Melanocytic Nevus. Despite being bullied as she’s gotten older, though, Ciera–now 19 years old–says she feels comfortable in her own skin. “Teenage boys are usually the first ones to comment when they see me. They say things like, ‘You look like you’re dirty, take a wash,'” she told the Daily Mail. Swaringen, who recently graduated high school and now works as a shoe store clerk, says she used to struggle to overcome the negative comments. “One day I remember being on the school bus and hearing a young boy laugh at me and call me a spotty dog. That really knocked my confidence, I was only young and it made me feel different to the other kids, like something was wrong with me,” she said of the condition, which affects around one in 500,000 people.